Gloom of Thrones - On Kickstarter! Gloom is coming? Nay. Gloom has arrived. 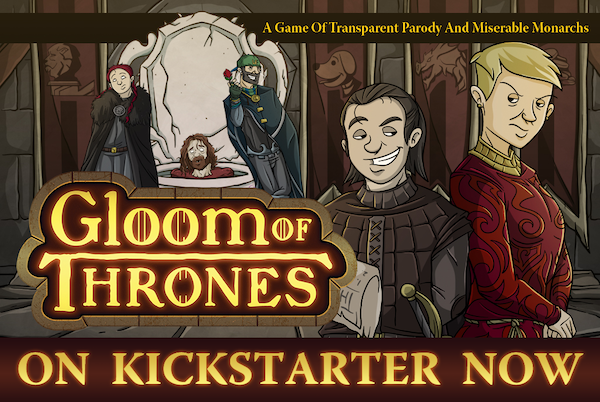 Gloom of Thrones, satirizing the award-winning TV show and combining it with the award-winning Gloom, is live on Kickstarter right now! Typsion Bannister, the Baron of Boobies and Booze! Sanserif Snark, who was promised Fairytale Gloom and wants to know who’s responsible for this. Kelly C, aka Queen Dani Rainybirth of House McDragonface. Josh Frost, whose father was [SPOILER], which makes him [SPOILER SPOILER SPOILER] and he also [SPOILER SPOILER SPOILER SPOILER SPOILER]. Shamey Bannister, whose support of his grieving sister in her time of sorrow has been remarkably stiff. And a brand new Porcelain Throne mechanic that brings fresh strategies to the table for existing Gloom fans. Prophecies of doom. Protagonists slopping through the wilderness. Battles of blood and mud. At least in Gloom of Thrones you know the story will get an ending. Plague them with mishaps like Seduced by a Sibling or Tumbled from a Tower while heaping happy events like w̶e̶d̶d̶i̶n̶g̶s̶ and family reunions onto your opponents to raise their Self-Worth score. Unique transparent cards let you play multiple cards on the same character, determining their ultimate fate while still allowing you to see straight through their machinations! Are you a Game Master? Are you a fan of Atlas Games’ award-winning roleplaying games like Ars Magica, Feng Shui, Over the Edge, and Unknown Armies? Would you be excited to share that passion with other fans and help introduce new players to these awesome games? Then we have a mission for you, Agent. Fill out and submit our Special Ops Application to sign up. As a member of Special Ops you’ll gain exclusive access to scenarios, early release material, playtests, events, and more. Plus, every mission you complete as a member of Special Ops – running demo games, helping with community outreach, supporting new players – will earn you Hazard Pay, which you’ll eventually be able to use at the Special Ops Black Market. Special Ops is an all-volunteer corps. If you’re ready to take the leap, sign up NOW! The title of the post pretty much says it all: We're looking for a great candidate to fill a newly created Marketing Coordinator position here at Atlas Games. The job is located in our Duluth, Minnesota office. We'll fill the position as soon as we find the right candidate, so while there's not a deadline to apply, there's also no guarantee it'll still be open if you wait too long. We look forward to hearing from you! The Atlas Games team is extremely happy to welcome Justin Alexander to the staff. 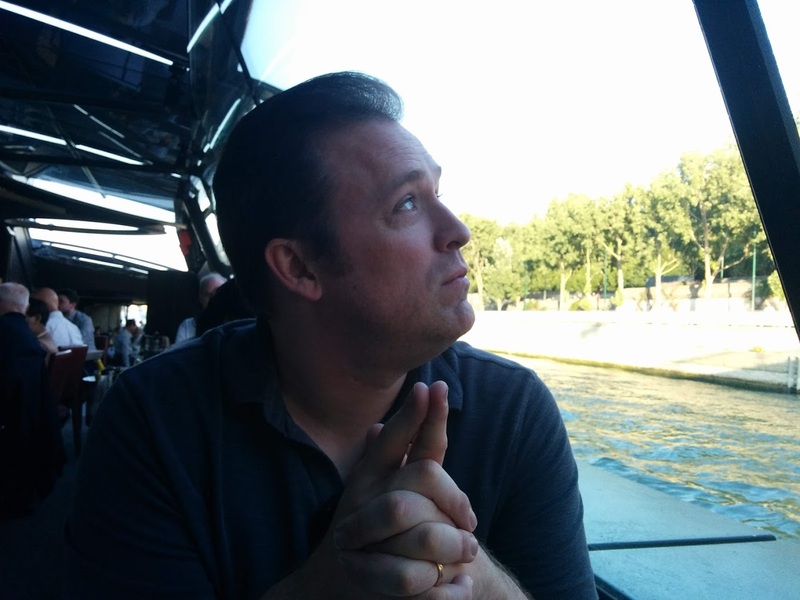 As our new RPG Producer and Developer, he’ll oversee all things roleplaying in light of long-time Atlas Games staffer Cam Banks’s recent move to New Zealand. Justin’s writing, development, and producing experience is extensive, and best discovered at his website, the Alexandrian. You can contact Justin by email at justin at atlas dash games dot com, and find him on Twitter at @hexcrawl. In talking to Justin and his past collaborators about the position, we were impressed by Justin’s prodigious work ethic and by his ideas about the ways an RPG’s mechanics and scenario structures ought to work together to present a coherent way of playing games in the real world. We’re excited to see this philosophy inform our future releases.